2 major wins are finally here! Two major wins that will improve the lives of temporary workers, as well as others in precarious work, are finally here! Equal pay for equal work came into effect on April 1, and today the government made a proclamation that has been a long time coming for temp workers. A bulletin released by the Ministry of Labour reports that Schedule 5 of Bill 18, the Stronger Workplaces for a Stronger Economy Act, has now been proclaimed. It is an amendment to the Workplace Safety and Insurance Act (WSIA) that will allow a new regulation to be created to make sure client companies of temporary agencies are held responsible for workplace accidents and injuries to temp workers. Both gains are direct results of organizing by Workers’ Action Centre members and our allies in the Fight for $15 and Fairness! These labour law wins will lessen employers’ incentive to use temporary agencies rather than hiring directly. Most importantly, the proclamation of Bill 18 will force client companies to be better at providing safe working conditions and offering adequate safety training. The regulation will ensure that the Workplace Safety and Insurance Board (WSIB) places the costs of workplace injuries on the client company where the accident occurred. As it stands right now, the temporary agency is supposed to take financial responsibility for the injury or death of a temp worker—even though the incident occurs at the client employer’s worksite! On top of that, temporary agencies can often disappear at a moment’s notice and never take responsibility for the injured or killed temp worker. Keep temp work temporary by ensuring temp workers are directly hired after 3 months on the job. Place a 20% cap on the number of temp workers used by a client company. Hold client companies and temporary agencies jointly accountable for all employment standards, including personal emergency leave. 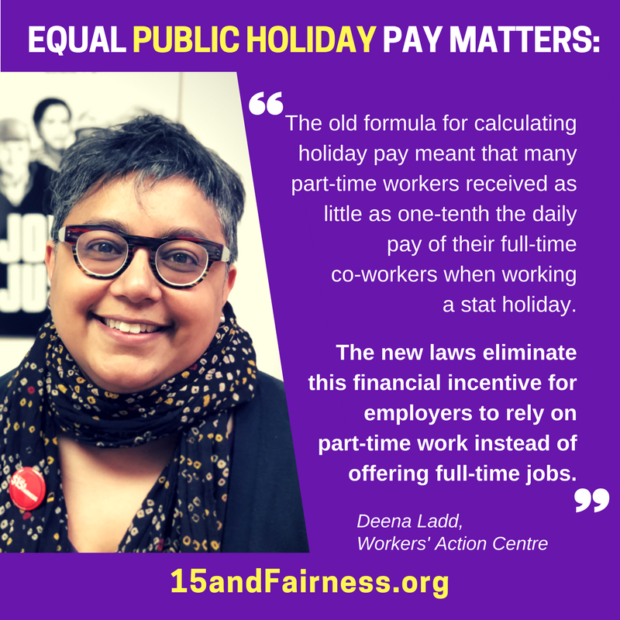 Help defend improved public holiday pay, one of our new wins for Ontario workers! Click here to share this image on Facebook. 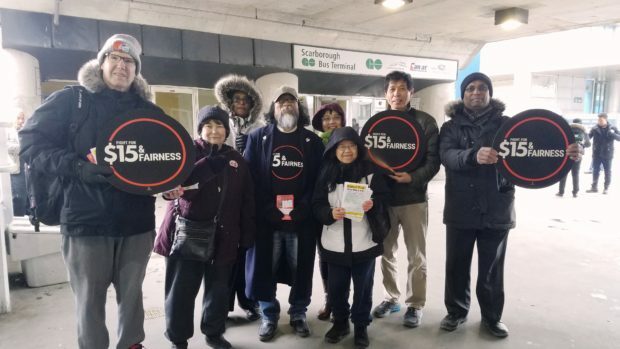 WAC members did outreach to workers in our communities, letting them know that employers must now give part-time, casual, contract, seasonal and temp workers the same rate of pay as full-time workers doing “substantially the same work” at the same workplace. For many workers, finally receiving equal pay will make even more of a difference in their lives than the increased minimum wage. The Workers’ Action Centre is here to support workers accessing the equal pay law. Though we have the right to ask without repercussions, it’s still a risk for workers to confront employers about our pay. Please call our phone line at 416-531-0778 if you are having problems defending this new right at your workplace. You can also download and share workers’ rights information with other workers. If you’d like to host a Workers’ Rights Workshop for at least 15 workers in your community, please reply to this email and we will help make it happen. We invite you to come out and support all our new labour laws in the weeks ahead. Get more involved with the Fight for $15 and Fairness, and show your support by displaying this window sign at your home or organization. Let’s send the message to all of our political parties that workers won’t stop pushing for decent work!